A strolling tour reveals the secrets of Old Town and its funniest resident. GIRL, INTERRUPTED Docent Margaret Hicks fields questions about the Second City. On a cool summer day, about 20 people follow tour guide Margaret Hicks through the streets of Old Town. As they pass a balloon-frame house, the seasoned docent explains with clear, concise delivery its significance in the history of Chicago architecture. 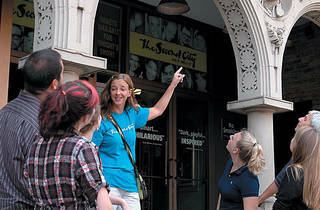 But then someone taps her on the shoulder to ask a burning question: “Does SNL still recruit cast members from the Second City?” This is the kind of query the easygoing Hicks routinely gets asked as part of the Second City’s Neighborhood Tour, which takes place every Wednesday and Sunday through October 4. As an improviser and a former docent for the Chicago Architecture Foundation, Hicks, who was laid off from her office job last fall at the same time she got married, saw an opportunity to create a humorous walking tour that revealed secrets of both the ’hood and its legendary comedy club. “I have this big belief in niches,” she says. “There’s a really specific talent for giving a tour. These two things coming together just seemed like a perfect marriage.” The Second City had done walking tours more than five years ago but since abandoned them. Along with box-office manager Sabrina Harper, Hicks persuaded management to give the tours another shot. “It took some convincing,” Hicks says. In her lively, 90-minute narrative, Hicks imparts a spirited history lesson of Old Town. Who knew that the walls at St. Michael Catholic Church (where Chris Farley worshipped) survived the Great Chicago Fire? Or that North and Wells used to be called German Broadway? Or that Piper’s Alley was named for Henry Piper? (The German baker-entrepreneur had a shop in the alley until it was paved in the ’60s.) Most on the walk, are delighted by this trivia. “When they first started the tour, they were more personality-based. I felt I could put some more actual information into them,” Hicks says. When a Brown Line train passes, she riffs on the history of Chicago’s elevated railway and its colorful creator, Charles Yerkes. Meanwhile, a stroll past the Fudge Pot, a candy shop on Wells, prompts a recounting of a feud between its owner, David Dattalo, and movie star Tom Cruise, who once skipped out on an appearance there. This surely will help the tour, which lacked Second City sparkle at its July debut. While that initial presentation included a tale about cast members getting busted at a speakeasy and an engaging story about a row between founder Bernie Sahlins and producer Joyce Sloane over the use of the Second City e.t.c. theater, tour groups clearly wanted more dish. 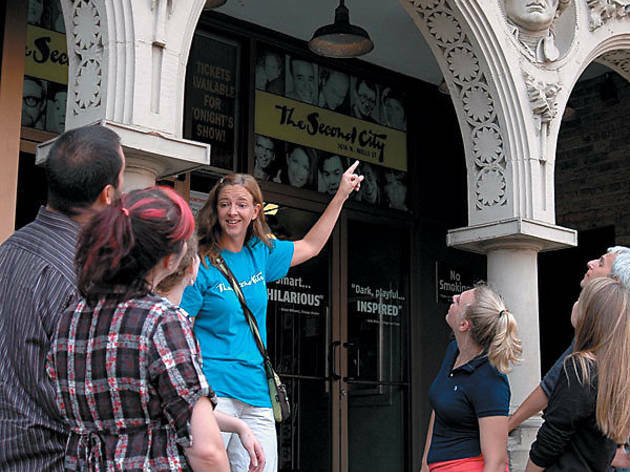 The Second City’s Neighborhood Tour happens Wednesdays and Sundays at 4pm and costs $15. Visit secondcity.com for more information.